Need a Check Engine Light is on Inspection? How Much does a Check Engine Light Inspection Cost? The check engine light is one of the most common lights to come on when there is an issue with your vehicle, but can be confusing to understand. It can come on for many reasons, serious or not so serious, so it is best to have your vehicle inspected as soon as the light comes on to prevent any damage occurring. How does the Check Engine Light Work? The Engine Control Unit (ECU) has sensors all through the engine and drivetrain to monitor the vital systems that allow the vehicle to operate correctly. If the ECU detects any issues with any of these systems, it will switch the ‘Check Engine Light’ on to alert the driver of the issue. It will also log a diagnostic trouble code (DTC) of the system that has failed. This will give the mechanic an idea of where to start looking in order to rectify the issue. The light will come on either in a solid state or flashing on and off. If the light is staying on and not flashing, this means that the ECU has detected an issue with the car that is not affecting the running of the vehicle in a major way. This could be caused by a failed oxygen sensor in the exhaust, a sensor in the engine reading incorrectly, or simply a fuel cap that is not secured properly. It could be a simple fix (in the case of the fuel cap, which would require tightening) or replacement of a faulty part. If the light is flashing however, this is an indication that something is seriously wrong. The CEL flashing means that there is a chance of serious engine or catalytic converter (located in the exhaust system) damage if the engine is operated continuously, usually caused by an emissions related problem. This may be felt through the vehicle misfiring, or an increase in fuel consumption and reduced performance. One of the easiest mistakes to make, and also the easiest to rectify. If the ECU notices a decrease in the pressure inside the fuel tank, it may switch on the check engine light. If the light comes on after recently filling with fuel, this may be the cause. Simply tightening it properly will rectify the pressure difference, and the light will switch off after a couple of ignition cycles. An emissions control issue will switch the check engine light on if the ECU detects an increase in fuel required, or senses a failure of a component. Most emissions issues will cause the check engine light to flash – and serious engine or exhaust damage may occur if the vehicle is operated continuously under this condition. 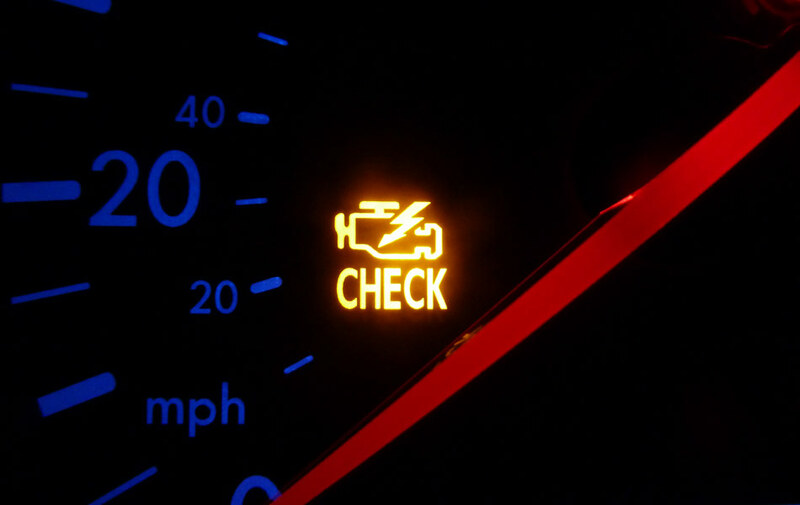 If you notice the check engine light flashing, pull over as soon as it is safe to do so, and have your vehicle inspected immediately to prevent any further damage. A bad spark plug or failed ignition component will cause the engine to misfire and the check engine light to come on. An issue with the fuel delivery system may cause the check engine light to illuminate. Poor fuel delivery, a faulty fuel injector or fuel pump will cause incorrect sensor readings in the exhaust and engine, as well as drivability issues. What’s Involved in a Check Engine Light is on Inspection? The mechanic will carry out a full diagnostic scan on the vehicle to retrieve the diagnostic trouble codes stored in the ECU, carry out diagnosis and interpretation of the codes and provide a quote to repair the vehicle if required. Unless you just have a loose fuel cap, it is essential to have your vehicle inspected as soon as possible, especially if the Check Engine Light is flashing – as ignoring it will cause costly and preventable engine damage.